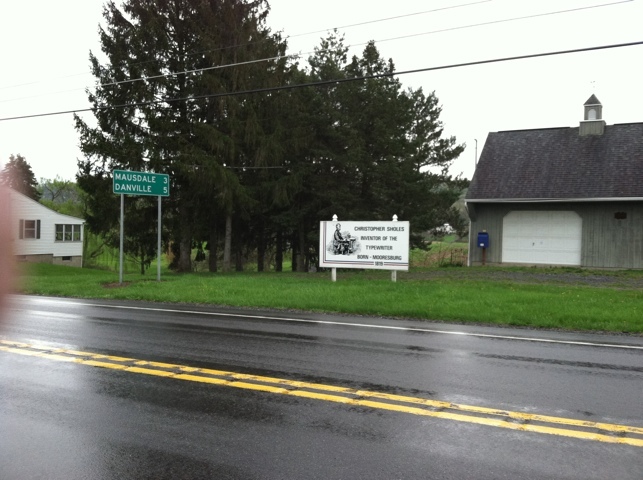 This morning we left Danville in wind-driven rain and headed west on Bike Route V(ictor). 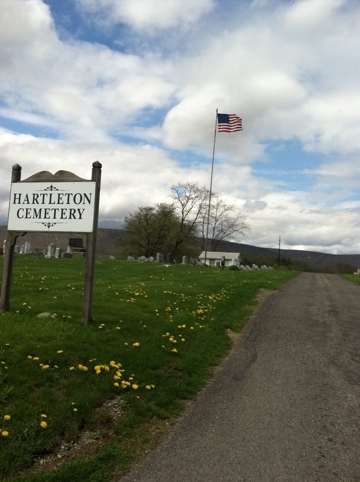 In Lewisburg, V turned north but we stuck to PA Route 45 to go through the Buffalo Valley to Aaronsburg, where Jeffrey’s guardian, Nancy, had arranged for us to stay. There are many nice things about the Buffalo Valley. The word “buffalo” is fun to say. The scenery is beautiful, almost unbelievably so, at least for us who like NE North American greenery and terrain. There are lots of hills, including a breathtaking rise not far from Aaronsburg, but as we were able to ride entirely up all but the breathtaker, they were fun in retrospect. There are many kind people — the cafe’ manager who took his family on cycling vacations decades ago, the customer who gave us route advice, Tom at the bike shop who made BikeE adjustments for free, the gentleman in a tiny town who offered Jeffrey a drink, the man who flagged us down in Aaronsburg out of curiosity because he’d seen us in Lewisburg earlier in the day, the B&B hosts who delayed their dinner to help us plot tomorrow’s route. There are interesting historical sites. There are Amish folks, evidently of various degrees of orthodoxy, in buggies, on bicycles, and working with machinery. There are the motorists who gave us a wide berth or hung back until it was safe to pass us. The bad thing about the Buffalo Valley is the west wind. It was so strong and steady that we couldn’t make even a poky 8 mph on the flats without an effort. Good thing we planned to ride only 50 miles today. Now for the lesson on how to live. 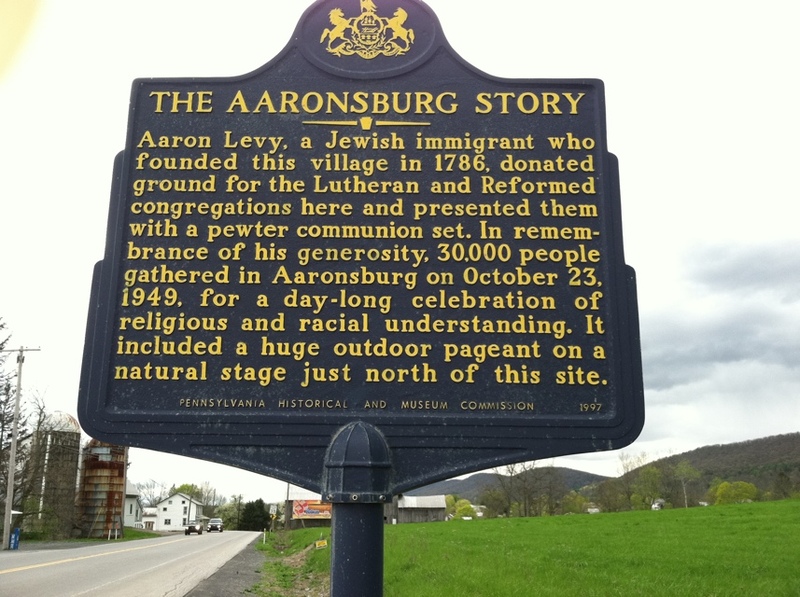 Below you’ll see the historical marker at the edge of Aaronsburg (in Penn Valley). If the print is too small to read, click on the pic to enlarge it. Think about it in light of what we have been saying about humanity, inhumanity, and hypocrisy. We can’t see Aaron Levy clearly through the mists of time, but it’s evident that he knew how to show respect to those of different origins. Maybe the friendliness of the locals has its roots in the tone Mr. Levy set. It couldn’t have hurt. The birthplace of the inventor of the typewriter. Jeffrey is a fan of mechanical typewriters and other machinery the workings of which can be understood by ordinary mortals. Here’s a look at the shoulder of Route 45. It’s pretty good for bicycling. 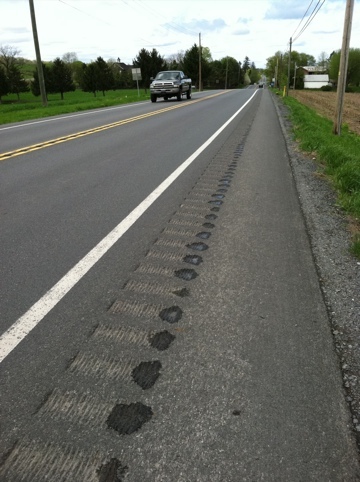 There are stretches with and without rumble strips, which narrow the lane but afford a little protection from inattentive drivers. 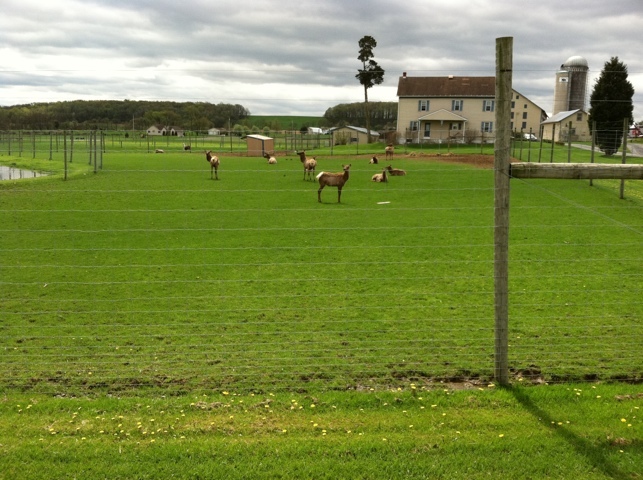 Ungulates at the edge of Mifflinburg. We attracted the attention of lots of cows and horses as we passed farms. We heard the animal sounds. We smelled the smells of various manures, of skunks, of soil and vegetation. You can’t do that from an airliner! Look at how the flag is held straight by the powerful wind! Too bad it wasn’t a tailwind. 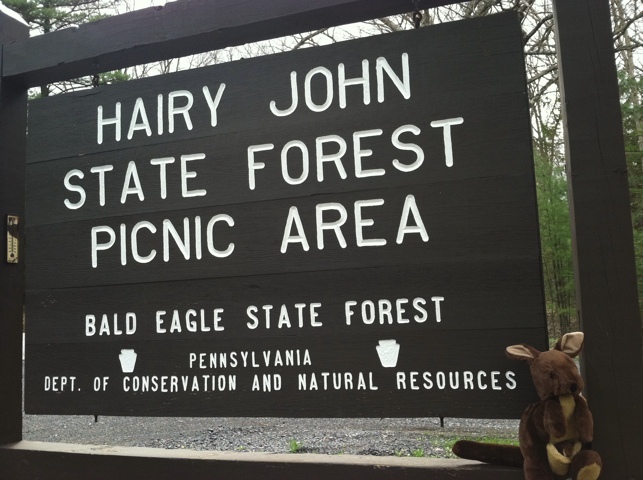 Here I am, at the lower right, by the Hairy John sign. Who or what is/was Hairy John? The sign doesn’t say. 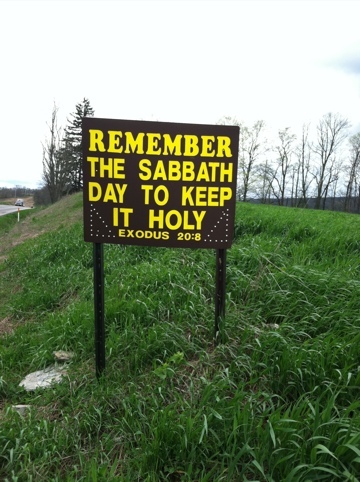 As we approached Aaronsburg, we saw this sign, reminding us to remember the Sabbath. Shabbat Shalom, a good Sabbath, a good day of rest to all, whatever that may mean to you or be for you. Having pledged to ride to Postville, and having a deadline to meet, we will keep rolling on Saturday and Sunday both. But we will obey sign and Scripture. We remember.